Kingston Grammar School is perhaps uniquely fortunate in having six living Head teachers and we were delighted to be able to gather them all together. It was a remarkable occasion, and one that may become something of a tradition in the years to come. 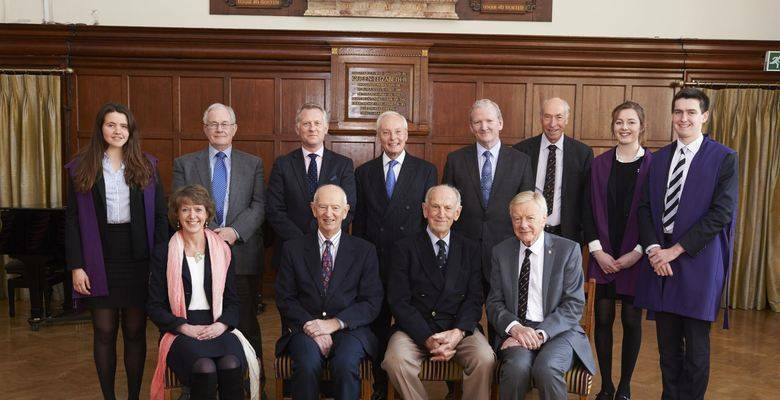 Along with the Chair of Governors, Dermot Rice, and his two surviving predecessors, Paul Marsh and John Elvidge, the six Heads, John Strover (1970-1977), Sidney Miller (1977-1987), Tony Creber (1987-1991), Duncan Baxter (1991-2009), Sarah Fletcher (2009-2014) and Stephen Lehec (2014 - ) posed for a photograph that will be hung in a prominent position, yet to be decided, to celebrate the occasion. There was tea, time to talk to some of the staff (the longest serving of whom, we calculate, would have worked under five of the Heads) and current members of the prefect body, and an opportunity to tour the school and note the changes that had been made over the 45 years of which our guests were the embodiment.